I figured I’d do another year long recap as I did at the conclusion of the 2010 season. Akin to last year, I’ll write up some statistics before moving into my opinions of high school football around the country and the fan support. In total, I’ve seen 73 different high school football games this year. I saw games in 16 different states and games in 17 of the possible 18 weeks that high school football is played throughout the country. I’ve seen games in 40 different venues in 40 different cities. I’ve seen 134 different teams play. In games I’ve attended, there were 3,528 points scored for an average of 48 points per game with an average score of 33-15. There were only three shutouts and only one team scored 70 or more. Of the 73 games, six games were not 11-man football. Those being three 8-man game in Albuquerque (NM), Springfield (CO) and Caddo (OK). 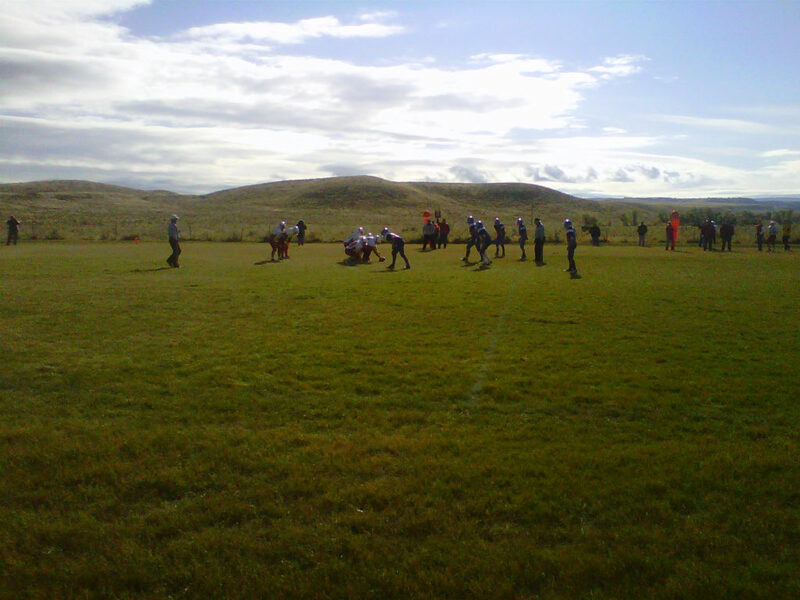 And, three 6-man games in Kaycee (WY), Jordan (MT) and Grass Range (MT). The most games seen in one weekend was 10 in Weeks 1 and 2 each. And 9 in Week 17. The fewest was one in week 10. And zero in Week Zero. I saw 17 state championship games and 16 other playoff games. Saw 125 different teams once. Saw Steubenville (OH) thrice. Saw Richmond Edison, Steubenville Catholic Central, Pickerington Central, Wheeling Linsly (WV), Indianapolis Cathedral (IN), Wiggins (CO), Lamar (CO), and Southlake Carroll (TX) twice each. Time for my breakdown on the quality of teams, fan support, organization, etc for the various states. Once again, Texas wins big for fan support with Ohio a decent second place. Texas is a no brainer. The games at Cowboys Stadium drew very well. Ohio is a strong #2 when you figure what the regular season games draw alone. I still have a personal opinion why the titles don’t draw well. Georgia surprised me and are solidly at #3. Sure, the games were in a dome, but they weren’t cheap. A walk-up ticket was $20 and pre-sale was $15. The Buford-Calhoun game that was being contested for the fourth straight year was not suffering for fan burnout and was extremely well attended. The Lovejoy-Tucker game, not so much. But, still a good crowd. I’m showing a little favoritism with #4 and #5, but I’m putting them there on a per capita basis. Montana’s Grass Range High School has 50 students 9-12 (boys and girls). Their co-op team is formed with Winnett High School which has 35 students 9-12 (boys and girls). They play six-man football as the Grass Range/Winnett Rangers in the field behind Grass Range High School. There was one senior on the entire team. There were 9 players total. They had 68 fans in the stadium not counting those that parked their cars near the field to watch that way. This was the season finale for two teams that were 0-7 and were not in really any game yet that season. And yet, it felt like the Super Bowl. That’s what high school football was about. It’s just a shame I had to rank Montana #4, but can’t justify any higher. Wyoming is a similar situation. The Kaycee and Cokeville games were very well attended for such small towns. Buffalo had a great atmosphere. And the crowd for the state semifinal in Green River was phenomenal. After that, it’s a much of middling states from #6 through #10. Now, we’re getting into some contentious issues. I put Pennsylvania low again, despite the great turnout for the District 10 Class A final between Sharpsville and West Middlesex. The WPIAL finals in Heinz Field are sparsely attended. And the Kickoff games were good, but just not great attendance to sway my opinion from the WPIAL games. North Dakota may just have been my choice (or, really my lack of choice) of games, and saw two oddballs. Fargo Davies was playing their second year against another big city team, Grand Forks Central. The other was in Bismarck between the local catholic school and the catholic school from Minot: Bishop Ryan that was a co-op with Sawyer. But, neither game was well attended. And the stadiums used for the games sucked any life out of the fans. It was antiseptic and sterile environments. North Carolina probably is higher, but the game I saw was lowly attended for what I was told was a rivalry game. In fact, the two met in the playoffs later on. Probably tempered by the rain, it just did not live up to the billing when it came to the fan support. And for being 19-14, the fans weren’t in it at all. And last, and least, is Nebraska. I had pegged Nebraska low last year from the Grand Island game. The Norfolk-Fremont game was pitiful. They’re rebuilding the stadium and it was under construction when I was there. But, the game had little fanfare. They had a chance for the playoffs at the time and yet the fans were rather suspect. The stadium is owned by the city, not the school. And three schools play there. Two being privates (Lutheran Northeast and Norfolk Catholic). Norfolk–the public school–were scheduled to play homecoming on a Thursday night. The newspaper had one line in the Thursday paper for the game. That was under the daily lineup of games in all sports. Not one article. Instead, the entire top half of the front sports page was previewing Norfolk Catholic’s potential playoff opponents and hoping for a rematch with their big rival. Now, as for the rankings, I’ve weighted it by what level I’ve seen, whether they’re public or private, whether I was seeing ‘good team’ or ‘bad teams’ for that state, etc. Again, I can’t separate Ohio and Texas by much. Texas, at the high end, wins out again. Straight up, Southlake Carroll would beat St. Ignatius. I’m rather confident of that. However, where Ohio wins is the fundamentals. As they say, Ohio is the cradle of coaches, and it shows in the teams. The players _may_ be better in Texas on average, but the teams in Ohio play better as a team. As I said last year about South Carolina, much less ‘put it in your star’s hand and let him do his thing’ and more ‘play fundamentally sound football and we will win’. Georgia, Pennsylvania and Colorado were easy up top. The lower level Colorado teams are very good ‘teams’ but may not have the star power to carry teams. Wyoming, Nebraska, New Mexico, and Kentucky are all based on being average quality. Montana gets thrown in there despite only seeing two 6-man games and judging that is difficult. But, the games were not flagfests, nor was it a one-man show. They played sound, albeit average, football that was executed about as well as you can expect when you just have to take whatever players are willing or able to play. And I do mean any. Grass Range, for instance, had 9 players, five of which were freshmen. Law of averages means two freshmen are playing, minimum, each snap. You’ve got to rely on pounding the fundamentals of the game into their brains rather than hoping brute force or finesse will somehow win you or keep you in a game. The lower end starts with North Carolina and Indiana. Both seemed to be ‘star player gets the ball and the other players hope he does well’. Some big plays, but getting very one-dimensional on offense and ‘big play’ defense. Missouri gets bad knocks because although they were sound in the Boonville-Moberly 7-0 slugfest, big screwups led to the only touchdown. And, being the only touchdown, it wasn’t for lack of chances. It was throwing them away that drags them down to #14. North Dakota and West Virginia round out the level. I really didn’t want to put West Virginia so low. But, there was a lot of fundamentally unsound play. Linsly plays well, but Morgantown, Weir, Madonna, and Oak Glen were haphazard a lot. None of the games were ‘good’. Not to say the teams can’t be ‘good’ or deserving of a higher spot, just I can’t justify it, either. Ohio wins for ease of use. Don’t underestimate being able to leave between games as a positive. The games that I rank worse are the ones you’re not allowed to leave without paying to reenter. The four games at Cowboys Stadium was well run and just a great day. Georgia’s games, albeit over priced, were well attended, well presented, etc. I especially liked that the Falcons signage and field markings were removed and replaced by GHSA logos at midfield, the endzone, and lower sideline railings. The Crosstown Showdown is good for the games I saw. Nippert Stadium is a good venue. The games at Dixie Heights and Colerain were a bit of a nuisance, but were well attended and enjoyable. The problem was too many games to choose which games to attend each day. Next up is the UIL finals at Cowboys Stadium. This event was put on very sloppy compared to the first ‘event’ there I attended. The next two were two-game events that were basically regular season games with a second game tacked on. The OVAC Kickoff was simple and well orchestrated. The Gateway Kickoff gets the lower spot because the games were moved to Sunday to accommodate television, were spaced out poorly, in a venue that doesn’t suit well to an all-day event. Games were spaced out too far apart, as well. And, TV made the games longer. The last two were the ones I didn’t like last year, but hoped they’d be better. The WPIAL finals at least had a good crowd for Knoch and the 4A game. But, not much. The crowds were pitiful. No in-out privileges. TV drug out the time to play the game. And the Herbie can only be described as ‘the Herbie’. Huge stadium, small crowds, TV dragging it out, no in-out, bad matchups, overpriced. The one reason I went to see the Gateway Kickoff Classic on that Sunday was just so I didn’t go to the Herbie for two straight days. Only reason to attend is the only games on a Monday. This is how I document games (date, sport, matchup, venue, city, state; the * are playoffs or ** are finals). I’ve tried to just mark this as great games, memorable, big finishes, close games, etc. But, a few blowouts are listed just because I enjoyed being at the game. The crowd, the teams, the pageantry, etc. This tends to, for me, side with the smaller teams. Conotton Valley (OH), Crystal City (MO), Jordan Garfield County (MT), Grass Range/Winnett (MT), and Caddo (OK) make this list because the game themselves transcended the play on the field. It was an event for that town and it was a fun time being there for it. Win, loss, or a blowout. Edison nearly came back, but failed at a two-point conversion. Boonville won a game with only one score and that was thanks to a turnover near the endzone in the third quarter. Fargo Davies won their first ever home game in school history. Bismarck St. Mary’s Central won, but lost on a playoff spot due to point differential. They had to win by 14 to make the playoffs thanks to North Dakota’s system. Steubenville-Massillon for obvious reasons. Eastern Alamance-Williams was a rivalry game and close, although sloppy. Powell gave up a lead, took it back, gave it up and came back to win with seconds left in a state semifinal. A game I will remember for a long time for game, atmosphere, ending, etc. Wiggins won a great game against a better team on the road. A little CHSAA 1A school with 19 players went all the way to the state final before losing via shutout. But, this game was great. Euless Trinity just was in a monumental struggle with Allen and hung on. Aliquippa was down, and then trailed 7-6 before scoring late in the fourth to win it, 14-7. North Allegheny-Upper St. Clair was a great overtime where North Allegheny scored a touchdown on a pass where the player was clearly out of bounds. Not one foot stepped foot in bounds. Norwayne-Kenton can only be described as epic. But, the next game on the list gives it a run, Calhoun-Buford. Fourth straight year playing in the title game against eachother. Buford were the 4-time defending state champions. Calhoun had the lead most of the game and were up 7 when all they needed to do was punt and pin them deep. A bad snap, a fumble on the punt attempt, and a return for a touchdown with less than a minute left. In overtime, Buford fumbled on the first play. Calhoun recovered. First play they wen’t for a field goal. It was good. The place rocked. Refugio (TX) had some grief over running up the score on teams under the argument that not playing starters late in the game left them ill-prepared for games where they had to play all game. Well, it happened anyways. Cisco made a strong comeback, but fell through at the end when after Refugio took an intentional safety, Cisco’s kick returner called a fair catch with little time left rather than running the 20 or so yards available from outkicking the coverage. Refugio (pronounced, Reh-fur-ee-oh) won their second title. And lastly, Southlake Carroll played a great game and #2 for Hightower played a great game. But, the team beat the player by the slimmest of margins. The worst would be Linsly-Allderdice, easily. One sided, and the only Allderdice touchdown scored with seconds left. Linsly then returned the kickoff for a touchdown with no time left. Beechwood-Simon Kenton (KY) was just boring. Never did it seem like Simon Kenton could contend. Moeller and PC was the same. For as close as a game, I not once felt PC could pull it off. Cathedral over Bishop Dwenger was so one-sided I missed the winning points as I was still just buying my ticket. After Bishop Dwenger’s first posession resulted in a field goal, that was all they could muster the rest of the game. Brush-Lamar (CO) was just one sided, although it took a while to develop. #1 hosting #16 in the state-wide playoffs will do that. Cedar Hill could muster nothing against the Dragons. Clairton abused Sto-Rox. And Marion Local crushed Buckeye Central in game not really worth the price of attendance. As I did last year, I can’t rank them myself. So, here’s the calprep rankings for each of the teams I saw in person this year. I understand the reason for Ohio’s down year was that the top regular season performers lost in the playoffs which prevented them from having more wins over good opponents. In perspective, the worst team I saw this year was Bellaire St. John Central. I knew that at the game. They got obliterated by the #13,198th team in the country and it could’ve been a lot, lot worse. #14700 Navajo Pine (Navajo, NM) is the worst team in the country (by Calpreps) and are only 159 spots behind St. John Central. Yet, I had a lot of fun at that Conotton Valley-St. John Central game. Last year I saw 56 games and wondered how I could top it. And though my plans went awry, I exceeded my wildest expectations. For 17 weeks, I averaged 4.2 games per week. With some planning. And some things to work out right financially. I’m setting the bar real high next year. 100 Games. That’s my goal. Will I reach it? Will I exceed it? Who knows. But, I know this year I had a blast traveling the country seeing as many games as I did. From small dots on the map in eastern Montana with 68 people in attendance to 40,000-plus at a $1.6 billion stadium in a thriving metropolis. It’s high school football. And it’s worth it. I’ve decided to add a little more onto my thoughts of the 2011 high school football season. A few things I failed to mention in my recap were stadiums, food, state setups, etc. So, I’m going to rank the stadiums that I witnessed games in and give a little description. Kaycee Field is a new stadium. The school just started playing football in 2010 and the stadium was only a year old. Just a nice, clean, new stadium that seats about 100. Farrand Field is older and has a rustic charm to it. Emphasis on ‘rust’. Still enjoyable with character. Ryan Field was a great place to watch a game. But, it’s more apt to say it was a ‘field’ than a ‘stadium’. It had four bleachers that could hold about 20 people each. But, most everyone just stood on the sideline to watch the game and migrated up and down the field with the action. Aaron Hale Field was a ‘traditional’ stadium. Built as one structure with a press box, etc. It was a solid facility. Caddo Bruin Field was nice, but its stands were broken into three segments that weren’t lined up together. And Milne II could hardly be called a stadium. Situated on the hill southeast of the main stadium, the practice or JV field used for Albuquerque Foothill was as bare bones as you could get. No tickets, no concessions, a minimal scoreboard and only seating on one side of the field for a Friday afternoon game. I may be bias, but Harding Stadium had everything. Great seating and view of the field. Scoreboard, press box, concessions, location, etc. Paul Brown Tiger Stadium is second simply because there is nothing near the stadium. It’s huge, great sightlines if you’re not behind a pole. Milne Stadium, one of two Albuquerque City Schools stadiums, is great. Done in a southwest style, it’s got two levels with concourses on the ‘home’ side, turf, good scoreboard, great view of downtown, great food, atmosphere and plenty of seating. A true ‘surprise’ for me this year and hope to attend more games there. Savage Stadium is an older public works stadium that literally sits on the street behind the press box. It’s been extended with metal risers beyond its old stone foundation. It’s in the residential area and has great sightlines. The home-side faces north to keep the sun away from the fans. Wolves Stadium has a spectacular view despite its residential area. Situated on a slope facing north toward the mountain, the interstate 80 tunnel and downtown along the river, it’s the only stadium I can rank high for only having seats on one side of the field. A fire station is situated across the street, where they shoot off fireworks and blare the airhorn and lights for big plays and scores. Which is very unique. Fawcett Stadiums gets high marks for its size, ease of access from the interstate, press box, but it just feels old when you’re there. Maybe it’s the plain gray bench covers. Been there many times, but it is what it is. Rice Mount-Joy Stadium, the home of Dixie Heights, is a good modern high school stadium. Artificial turf, nice concourse/endzone area with concessions. Decent stadium. Good view from home side. Dr. JJ Commerford Stadium in Crystal City makes the top ten for being just extremely unique. It’s old. It’s run down. It’s steep. Really steep. It’s hard concrete with no wooden slats. But, it’s in a very unique location situated high above the Mississippi River flood plain. A railroad track sits just behind the treeline opposite the stands. There’s only one seating area, and the scoreboard is way to the south of the endzone beyond the track. You have to walk down the hillside over a walking bridge to the top of the stadium. There’s at least 30 rows of seats. All concrete. Just built like giant steps. It has artificial turf. But it has atmosphere. A lot of it. Platte Valley Stadium is a nice, simple stadium. Concrete base structure with metal seating and flooring up top. The concession stand is under the seating area which makes it impossible to see the game when standing in line. The stadium gives an expansive view of farm land to the east and north. And lastly, is Gene Reagan Field. This stadium is situated on a sloping hillside. The stands are built onto the hill and the precipice continues around the west endzone before tapering down to the visitors side. A track abuts the hillside perfectly. The concession stand is part of the high school up on the hillside. A lot of people sit along the ridge in lawn chairs. The blacktop up top is the social gathering place. A great atmosphere and definitely feels like the social event of the week for the town. A little less info than the top ten. Texas may have big stadiums, and Bulldog Stadium is no exception, but the stadium just is big. There’s not any character to it. It’s a metal riser that stands high into the sky that’s short from end to end. Bismarck has an all-purpose stadium that handles three high schools and two colleges. It’s decent, but lacks character. Gaskill Field in Limon would be top ten if the stands were consistent. The two non-centerfield stands are stepped back a few feet that makes sightlines harder if you don’t sit far enough to the endzone. Panther Field in Cokeville is simple and small, like Kaycee Field. Antimarino Stadium lacks atmosphere, but is situated well. Only one stand, though and it’s far from the field. Conotton Valley High School’s Stadium (which I can’t find a name for) is a nice small stadium that sits above the road behind the school. Definitely a fun place to watch a game even if the team doesn’t win that many. Bison Bowl in Buffalo, WY is a new stadium, but just doesn’t have atmosphere. Cardinal Stadium in Colerain is a hole. For a Division I team, the stadium isn’t good. Was very unimpressed by it. Nelson Field in Bellaire gets low marks by me because they only play day games, but then put up a roof on the home side to block the sun for the home fans. Norfolk Memorial Field was under construction, but is city-owned and doesn’t appear that it’s going to have any real character of its own. And lastly, Jimmy Carey Stadium can’t see the wrecking ball soon enough. Hearing about this stadium for a while, I finally went to see a game there between Steubenville Catholic Central and Weirton Madonna. This is a stadium on life support. It exists simply because they had nothing better. Which, they soon will with Weir High’s new on-campus stadium. 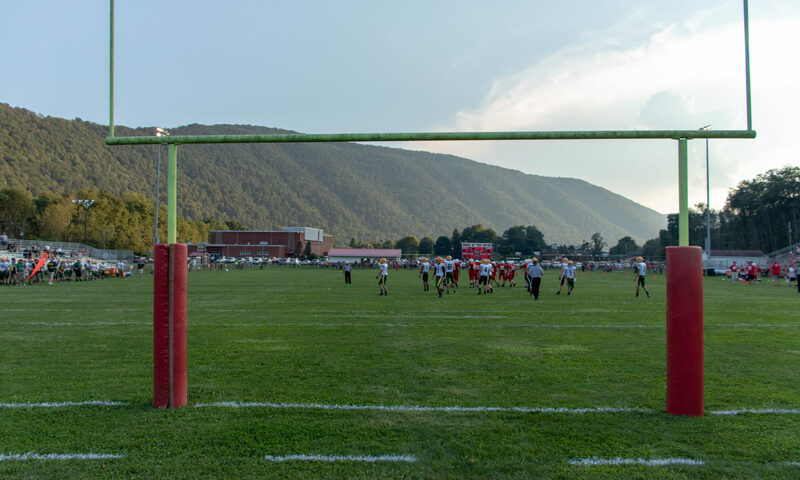 This field is situated behind the steel mill and a mountain. But, the home fans get a view of the steel mill with an obviously placed corporate logo for the mill above the visitors stands. The seating sits way above the field. Parking was a nightmare for a sparsely attended game (by the home side). The field is old, not lined well, poor scoreboard. I can at least say I saw a game there before it is no more. That’s about as much as I can, as well. Cowboys Stadium would be top one through ten in any list. The stadium is amazing. It’s pricy, but amazing. The Georgia Dome made for a great atmosphere in the way that the Metrodome did last year. Nippert Stadium is the best ‘open air’ stadium simply because it has a lot of character being situated on campus shoehorned into its location. For high school, it’s decent because the lower bowl holds the fans well. Ohio Stadium just engulfs a small high school crowd. Ten thousand would still seem miniscule. It’s a behemoth best suited for college games where 100,000+ is deafening. And lastly is Heinz Field. The stadium doesn’t do high school football justice. The Steelers complain about what their field looks like after the WPIAL games are played. But, nobody thinks of how horrible the field looks by the time the 4A game kicks off. At least a week later when the Steelers play, the grounds crew have had a chance to try and make it playable. There’s been some great food at some of these games. A lot of regional and cultural specialties. I’m not going to rank them, but will list my favorites or best. Albuquerque (NM) – “El Nino” – A burrito made of pulled pork, a hot barbeque sauce and potato. Unbelievably good. Kaycee (WY) – Home-made chicken tamales – Very good. First time I’d ever had one. They sold out. Which was no surprise. Buffalo (WY) – Grilled Ribeye Sandwich – Need I say more. Fresh meat, sliced thin, grilled on a wood-fired grill. Huge sandwich. Unbelievable for $4. Norfolk (NE) – Chicken On A Stick – Just great flavor, cooked in aluminum foil really locks in the flavor. Norfolk (NE) – Cheeseburger – Only place I’ll put a hamburger on this list. Unbelievably fresh coming from the farmland. Grilled on site, cheese added while on grill, not cold. Fargo (ND) – Free brats and hamburgers – Outside the stadium thanks to a sponsor. Not the greatest. But it was free. Grass Range (MT) – Maple Donuts – Fresh trays of maple sticks. Not a lot of food options here, and I had already eaten lunch. But, for 50 cents a great game food. Mebane (NC) – Southern Style Chicken Sandwich – Appeared to be made fresh. They weren’t Chik-Fil-A or such. Limon (CO) – Taco In A Bag – A lot of places have them, but this was the best. Used chili with beans (not a big fan) on Fritos with sour cream and nacho cheese. Unbelievable flavor compared to those I’ve found in Ohio. Springfield (CO) – Chicken Wings – 4 Wing pieces for $2. Were hand breaded and kept warm wrapped in tin foil. I had a dozen for $6. A deal no matter where you are. Caddo (OK) – Nachos with Chili – These weren’t every day nachos with taco meat. This was chili (no beans) smothered with nacho cheese. Seemed to sell very well here. No surprise. Now, outside the stadiums there’s a few places I ate at that also deserve mentioning. Kersey (CO) – New Kersey Inn – Had a late breakfast and then early dinner here before the game. Great food. Had a buffalo burger and a barbaque sandwich. Great food located a half mile west of the stadium. Right at the corner of the old US34 (now bypassed one block further north) and the main street. Jordan (MT) – Fellman’s – Had dinner at night before the game. Had a huge burger that was great with bacon. The next morning, I ate a breakfast that included hashbrowns and ‘side pork’. Not as good as bacon, had a ‘gamy’ flavor to it. Grass Range (MT) – Little Montana Truck Stop & Cafe – Had a burger (very good), but the reason for ever stopping here again is simple: fresh Raspberry Pie. It was chilled and was unbelievable. Springfield (CO) – Pappy’s BBQ – I ate here on the walk to the school and on the way back. Even after eating a dozen wings at the game, I couldn’t pass up another sandwich here. Had a pulled pork sandwich on the walk in. And a burger on the way back. This is just for tickets, parking, cab fare, stadium food, souvenirs, etc. Not included are work related travel costs that put me in the town, food outside the stadium, etc. I’m also not including the gas for the first two weeks and the Ohio title games because I didn’t keep track nor care. Some of these are estimates. $350 – Tickets, including season tickets for Big Red, and averaging about $5 for tickets nationwide. Some games I got in free. Wyoming doesn’t charge admission for regular season contest, for instance. Georgia was the highest at $20 for two games at the Georgia Dome. $340 – Parking and cab fare. The biggest was parking at Cowboys Stadium ($50/day for bus/RV rate for three days). Cab far was relatively $30 round trip up to $45 at the most. Took the cab in Fort Wayne (IN), Fargo (ND), Bismarck (ND), Mebane (NC), Albuquerque (NM) [one-way only], and parking at Cincinnati for Nippert and Heinz Field. $50 – Programs & souvenirs. Souvenirs included a seat cushion ($5) and lanyard ($0.50) at Crystal City (MO). For hard concrete, the seat cushions were big sellers, and a great value. Everything else was either programs or free giveaways. Such as a t-shirt for homecoming at Buffalo (WY). Or horns, flags, banners, etc. A lot of the games I’m not near the stadium and either in a town I can’t get a cab, or I just want to walk. The longest walk for a game was Crystal City (MO) on a beautiful Saturday afternoon. It was a six-mile round trip to the stadium from where i was at. These are only to and/or from the stadium. I’m also counting the in-between at Albuquerque where I walked over to the university to watch two parts of two soccer games. Crystal City (MO) – 6.2 mile round trip. Albuquerque (NM) – 6.1 mile total, one-way and between stadiums. Cab ride on way back. Norfolk (NE) – 4.6 mile round trip. Springfield (CO) – 4.0 mile round trip. Lamar (CO) – 2.4 mile round trip. Limon (CO) – 2.4 mile round trip. Florence (KY) – 2.2 mile round trip. Caddo (OK) – 1.4 mile round trip. Cokeville (WY) – 1.2 mile round trip. Kersey (CO) – 1.0 mile round trip. Kaycee (WY) – 0.8 mile round trip. Jordan (MT) – 0.6 mile round trip. Grass Range (MT) – 0.6 mile round trip. So, for games that I didn’t call a cab, drive a vehicle, or ride mass transit to attend. These games were because I walked from where I was at to the stadium and–except in one occasion–walked back. In total, I walked 33.5 miles to attend these 14 games (Albuquerque was two games, and two college soccer games). Crystal City was my biggest surprise as I had no intention of seeing a game on Saturday. I had already seen games in Norfolk (NE) and Boonville (MO) that week and wasn’t expecting any games on Saturday. But, I wound up in Herculaneum, a town bordering Crystal City and found that the homecoming game was being played on a Saturday due a weird scheduling snafu. But, without mass transit or a cab company, I decided to walk the 3.1 miles to and from the stadium. Took just over an hour each way. Great exercise on a beautiful day. It couldn’t have been more perfect. In all, with incidentals and driving from Steubenville to Cincinnati, Columbus, Pittsburgh, Stark County, etc. I’d have probably spent about $1,100-1,300 to attend the 73 games this year. Which came out a lot cheaper than the 56 games I saw last year. The final tally will be my impression of how well run football is run in the state, mostly for the playoffs. But, also how the regular season is handled. This is not referencing quality of play or fan support. But, how well run the state organization appeared to be from the perspective of being in the stands of a game in the state. Colorado is a surprise. But, their season structure and playoffs were well run for such a large state. The two big divisions play at Mile High, the next two play at suburban Aurora, while the rest are played at one of the two teams’ home stadium. Despite that, I feel Colorado handles their playoffs well due to a 16-team state-wide tournament for the 1A and 2A that has a sense of officialism to it. #1 vs. #16, for instance. And for such a huge state. Ohio gets high marks for the Harbins, regions, etc. No mandatory scheduling, leagues, conferences, etc. Texas is run very well, but has district play where you’re required to play certain other teams. Generally, the list deviates at #12 North Dakota through #15 Nebraska because most (not including New Mexico) require playoff games to be played on non-traditional days to squeeze in extra rounds of playoffs without actually adding another week. This is necissary for states like North Dakota, South Dakota, Montana, Minnesota, etc where the weather dictates that a season can’t last too long. Pennsylvania can really only be ahead of the likes of New Jersey, Massachusetts, and California when it comes to how the state association is run. Split into 12 districts of 13 autonomous groups (District 12 is split into Philadelphia Public League and Philadelphia Catholic League) that have varying rules on seasonal structure, playoff structure, playoff participation, where you join the state playoff at, etc. Some districts have higher seed host, while others play all neutral sites. Some are a mix. It also creates situations where a 3-7 Pittsburgh Oliver team makes the playoffs, by default. Being the highest rated 2A school in District 9, they get into the playoffs. That’s crazy. At least with Indiana the system, as screwed up as it is, is accepted, easy to understand, and has clear rules. Not necessarily whole games, or even good games. But, moments this year that made this so fun to do. These are things I look back on from this year and probably will remember these key points. I remember every game I’ve been to in vague terms no matter what. But, other than plays, etc these are moments I remember and look back fondly at. 1 – End of Grass Range/Winnett-Rosebud – This is a moment I’ll remember for years. And it happened in the most unlikely of places. Two 0-7 teams playing their last game of the season. Grass Range had gone up 36-33 in the fourth and Rosebud was driving down the field. And then Grass Range forced a 4th & 1. They stopped it. The parents, students, etc., rushed the field after the game. It really showed what this sport is all about. It wasn’t ‘win at all cost’. It was just pride in their towns, pride in their schools, and never giving up. The record book may show they were 1-7 that year. But, they’re winners where the scoreboard doesn’t keep track. 2 – Steubenville hosting Massillon – Second time I got to see it. And again, it was just overwhelming. Winning easily made it all the better. 3 – Walking to/from Crystal City, MO – This was a one-sided game on a Saturday afternoon. But the walk was just enjoyable, the stadium is an amazing relic along the river overlooking the flood plain. A game I was so glad I saw even if the score doesn’t match up with the memories of it. 4 – Rise and Fall of Green River – The end of this game was monumental. Powell had the lead, and Green River scored to take it with little time left. The crowd was going crazy. Fireworks were set off, the firetrucks were blaring their airhorns. And then Powell drove the field in just a few plays after decent starting field position. The sudden double change in fortune was remarkable. 5 – Crosstown Showdown – This was fun. The whole event. Even if a lot of the games failed to live up to the hype. I slept in my car to save money (something I do regularly). 6 – Huddling Under The Press Box – At the Gateway Kickoff Classic in Monroeville, an approaching lightning storm forced all the fans to huddle under the pressbox to wait it out. It was cramped, humid and generally miserable. But, it’s something that I’ll remember. 7 – Horrible Humidity in Steubenville – The night of the Steubenville-Akron Buchtel game in Week 2 was miserable. My clothes were soaked with sweat. I drank six bottles of water and still was thirsty. The heat was bad, but the overwhelming humidity made it nearly unbearable. The conditioning of the two teams was evident as Big Red pulled away while Buchtel seized up. Well, that sums it up. It was an amazing year. 73 games in 17 weeks. Far eclipsing my 56 games I saw last year. Not sure what I’ll be doing next year. But, I’m looking forward to it.